This workshop is the opportunity to learn even more about chocolate and how to work with it. An original idea for a gift or a time to share together, this cooking lesson will satisfy your curiosity and improve your chocolate making skills! Every occasion is a good opportunity to learn (or taste) a little more about chocolate! Why not for a bridal shower or a party with friends! Come and meet our chocolate maker at the museum some Saturdays of the month, 10mn from Strasbourg for a gourmet morning. 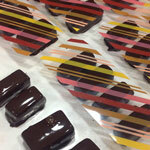 Enjoy a class with the museum's chocolate maker! Discover the steps to make chocolate candies : from tempering to molding, you will know all the secrets of these small chocolates! Requirements : 8 persons, minimum 15 years old. Booking with mandatory payment 59,00€/p. We gather around a coffee to get to know each other and exchange a few words. All go the "lab" for a close contact (and taste?) with the chocolate. From tempering to molding, the entire process of how to make small chocolates. While it cools down lets enjoy and visit the museum : tasting, the gourmet tour and at last... you will take the chocolate maker's place and do the demonstration. All you need to do is to strip, wrap and take your creations back home to enjoy them with friends and family.